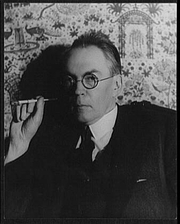 Cabell, Branch - (James Branch Cabell)kăˈbəl, 1879–1958, American novelist, b. Richmond, Va., grad. William and Mary, 1898. "As a mnemonic for the pronunciation of his name, he wrote: 'Tell the rabble / My name is Cabell.' (2004, F Brett Cox, editor)" After various experiences as a journalist and as a clerk for a coal mining company he began writing fiction. His early works, which are sophisticated novels deriding conventional history, include Gallantry (1907), Chivalry (1909), and The Rivet in Grandfather's Neck (1915). Many of Cabell's most popular novels are set in the imaginary medieval kingdom of Poictesme; among these are The Cream of the Jest (1917), Jurgen (1919)—Cabell's most famous work because of its attempted suppression on charges of obscenity—and The Silver Stallion (1926). Cabell's novels are usually pointedly antirealistic, and many of them can be considered moral allegories. Although he was enormously popular in the 1920s, his highly artifical prose style and subject matter lost favor with critics and public alike by the 1930s. His nonfiction writing includes Beyond Life (1919), The St. Johns (with A. J. Hanna, 1943), and Let Me Lie (1947). James Branch Cabell is currently considered a "single author." If one or more works are by a distinct, homonymous authors, go ahead and split the author. James Branch Cabell is composed of 24 names. You can examine and separate out names.